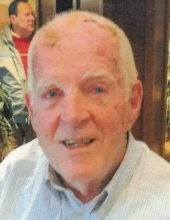 FRANCIS, John G. of Norwood passed away peacefully on October 10, 2018 at the age of 84. John attended Cathedral High School and Boston College before serving as a Lieutenant in the U.S. Navy and later Human Resources Manager at Analog Devices in Norwood. John will be remembered for his strong faith, passion for travel, and dedication to his family. His contagious spirit brightened many days. John’s past roles include Grand Knight of Norwood Council 252, President Neponset Valley Chamber of Commerce, and active member of St. Catherine’s Church. Left to honor and love him is his beloved wife of over 60 years, Barbara T. (Whelton), and children Donna (Kevin) MacLean of Norwood; Carolyn (Mark) Latham of St. John’s, FL; Jack (Michele) Francis of Fleming Island, FL; and son-in-law, Robert Gorgone, of Franconia, NH. Cherishced Grandfather of Katelyn (Dan), Lindsay (Anthony), Scott, Dan, Jennifer, Andrew, John, Krista, and KC. Great-Grandfather of Theo, Tucker, and Sawyer. He is also survived by many brothers and sisters, nieces, nephews, extended family and friends. John was preceded in death by his daughter, Kathleen Gorgone. Funeral from the Kraw-Kornack Funeral Home 1248 Washington St. Norwood Saturday, Oct. 13, 2018 at 9am followed by a funeral mass at 11am at St. Catherine of Siena Church Norwood. Visiting hours will be held on Saturday morning only from 9am-10:30am. Burial will be at Highland Cemetery Norwood. In lieu of flowers, donations may be made in his name to the Norwood Knights of Columbus 572 Nichols St. Norwood, MA 02062 or to the Norwood Parents Music Association PO Box 454 Norwood, MA 02062. To plant a tree in memory of John G. Francis, please visit our Tribute Store. "Email Address" would like to share the life celebration of John G. Francis. Click on the "link" to go to share a favorite memory or leave a condolence message for the family.